Primarily developed within the UK to be used for the refurbishment of high-rise buildings, rainscreen façades provide buildings with known performance benefits, whilst being able to minimise the carbon footprint of any development due to their lightweight yet strong nature. Both aesthetically pleasing and functional, innovations in rainscreen façades and further developments in existing technology has seen the introduction of new, cutting-edge methods of covering a new or renovated building’s exterior. With greater demands for versatility, durability and state-of-the-art aesthetics, ventilated rainscreen façades are the latest cladding solution to generate great interest amongst today’s architects, specifiers and installers. 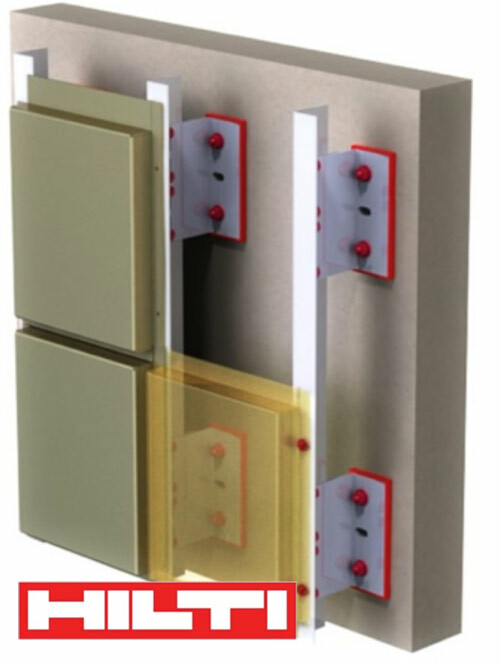 Eltherington is leading the way with innovations in this area and is now an official supplier of the Hilti Eurofox substructure system for architectural façades, offering customers a wider range of options for installing rear ventilated façades. There are many benefits of this system to designers, specifiers and installers, principally with it providing a fast, safe and easy installation process. The ventilated façade design incorporates a space for air flow in-between the façade itself and the structural wall which helps to enhance thermoregulation and improve a building’s energy efficiency. The Eurofox ventilated façade is mill finish extruded aluminium that holds the panel to the building. Before the introduction of rainscreen cladding solutions, it was the job of a building’s primary exterior wall to protect the interior of the property from the weather elements. Not only do Eurofox ventilated rainscreen façades protect against rain and wind, their advanced design can also enhance a building’s acoustic performance as a result of the air cavity which helps to provide acoustic insulation from the outside elements. As a separate element to the structure of any building, new or old, a ventilated rainscreen façade can be repaired or replaced as and when necessary meaning that building developments can sustain an effective aesthetic finish for long periods of time. Commonly specified on a large and growing number of rainscreen façade projects, the Eurofox hanging system enables Eltherington rainscreen cladding to create elegant and geometric building designs that appear to defy gravity. As the market leading hanging design system, Eltherington customers will benefit from specialist support from teams at Hilti alongside our own support services at all stages of the design and installation processes, to ensure outcomes are fully optimized on site. Since extending the choice for customers by supplying the Hilti Eurofox substructure, we’ve seen a rise in enquiries and sales as more of our customers learn about the benefits of ventilated façades. Being one of the UK’s leading facades and internal fit out specialists for the architectural and modular sectors, we are able to offer customers one of the widest ranges of cladding and façade architectural solutions in the market.